In 1945, a disabled World War II veteran named Jack Fisher petitioned the city of Kalamazoo, Michigan to make cuts in the street curbs in order to allow him and other wheelchair users to navigate the city more easily. City Manager Edward S. Clark, whose adult son used a wheelchair, understood the problem first-hand. The City Commission authorized the construction of cement ramps with safety rails in the central business district. Because Fisher’s arguments found a sympathetic audience, curb cuts were introduced around the city, and thus was born what has become a ubiquitous feature of our built environment today. In the decades that followed Fisher’s advocacy, as curb cuts became more commonplace, it became clear they were not just for wheelchair users. They proved a welcoming feature of the environment for parents wheeling children in strollers, for senior citizens who had trouble with stairs and steps, for people temporarily on crutches, for bike riders and skateboarders and more. What began as an accommodation for people with disabilities became a design strategy that had almost universal appeal. Just like the evolution of curb cuts from an accommodation to a ubiquitous design feature, educators should take the diversity of learners into consideration as they design their classroom activities. While the presence of technology has remained constant, the ways that schools are using it has changed considerably over the last decade. This might have been brought about by the increase of technological devices, but it also reflects a fundamental shift in the way educators think about technology and how to utilize it in their classrooms. Enter the Hyperdoc. Isn’t a Hyperdoc just a Google doc with hyperlinks? No, Hyperdocs are so much more. 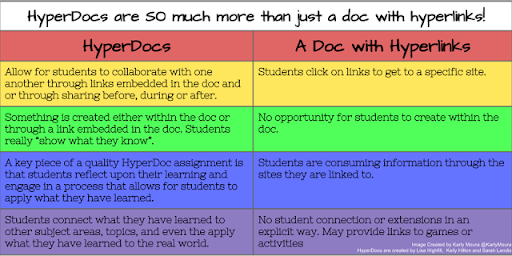 Creating a Hyperdoc requires the teacher to take into consideration the needs of the students, how they engage with the content, ways they reflect on their own learning, and how they show what they learned. Students enjoy the learning, collaborating, creating, and reflecting in their Hyperdoc while the teacher connects with students and engages in quality conversations with them about their learning. What’s the difference between a HyperDocs and a WebQuest? While HyperDocs and WebQuests have some characteristics in common they are actually quite different. Hyperdocs create quality inquiry-based learning experiences. These lessons allow students to explore the content, adjust their understanding through the explanation of the concepts, then apply their knowledge in a meaningful way. These blended learning lessons can be designed to meet the needs of each classroom. Some teachers may choose to design them for independent, self-paced learning, while others design them to blend with different instructional strategies varying from 1:1 , small group instruction, to whole group teacher-directed instruction. Teachers are tasked with integrating several best instructional practices to meet the needs of every learner. 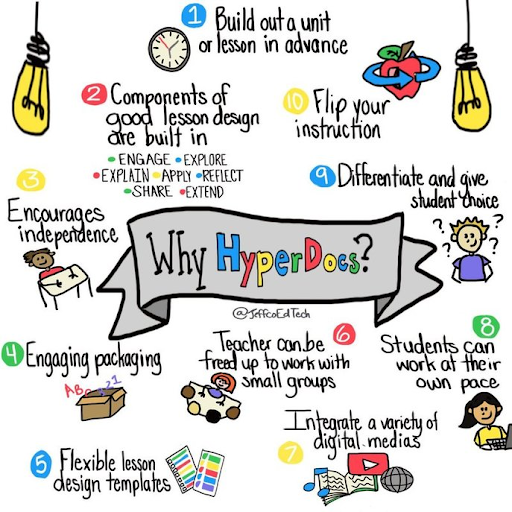 Whether they are trying to reach a language learner or student with Special Ed needs, want to integrate ISTE standards, or increase the level of critical thinking, HyperDocs help educators accomplish this goal. By engaging students in this deeper learning, teachers are providing them with the mindset that they can be on the cutting edge of learning. 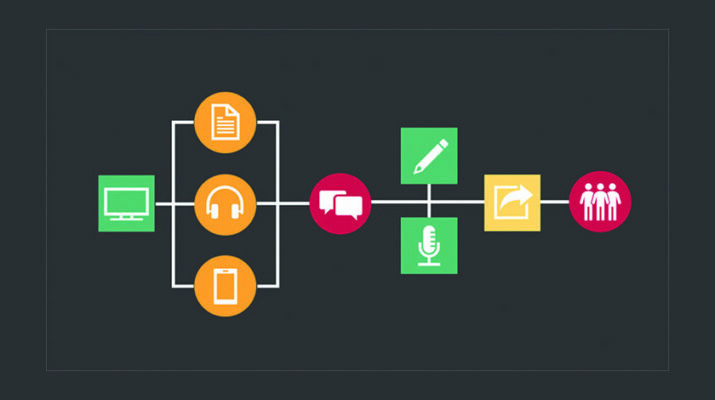 Whether it’s the omnipresent design of street curbs or being on the forefront of instructional technology in the classroom, the almost universal appeal of Hyperdocs will provide a diverse opportunity for student success in our schools. Digital Learning Day – We’ve Got This!